CAPE CANAVERAL, Florida -- The Venus Transit 2012 will take place today on June 5th, 2012, just after yesterday's partial lunar eclipse. Venus will pass across the face of the Sun, producing a silhouette that NASA officials say no one alive today will likely see again during another Venus Transit. The Venus Transit 2012 will not produce a partial solar eclipse observable with the naked eye as some may think. Transits of Venus are very rare, coming in pairs separated by more than a hundred years. This June's transit, the bookend of a 2004-2012 pair, won't be repeated until the year 2117. Fortunately, the event is widely visible. Observers on seven continents, even a sliver of Antarctica, will be in position to see it. The nearly 7-hour transit begins at 6:09 p.m. Eastern Daylight Time on June 5th, 2012. The timing favors observers in the mid-Pacific where the sun is high overhead during the crossing. In the USA, including Florida, the transit will be at its best around sunset. Observing tip: NASA officials say not to stare at the Sun. Venus covers too little of the solar disk to block the blinding glare. Instead, use some type of projection technique or a solar filter. A #14 welder's glass is a good choice. Many astronomy clubs will have solar telescopes set up to observe the event; contact your local club for details. Transits of Venus first gained worldwide attention in the 18th century. In those days, the size of the solar system was one of the biggest mysteries of science. The relative spacing of planets was known, but not their absolute distances. Venus was the key, according to astronomer Edmund Halley. He realized that by observing transits from widely-spaced locations on Earth it should be possible to triangulate the distance to Venus using the principles of parallax. The idea galvanized scientists who set off on expeditions around the world to view a pair of transits in the 1760s. The great explorer James Cook himself was dispatched to observe one from Tahiti, a place as alien to 18th-century Europeans as the Moon or Mars might seem to us now. Some historians have called the international effort the "the Apollo program of the 18th century." In retrospect, the experiment falls into the category of things that sound better than they actually are. Bad weather, primitive optics, and the natural "fuzziness" of Venus’s atmosphere and other factors prevented those early observers from gathering the data they needed. Proper timing of a transit would have to wait for the invention of photography in the century after Cook’s voyage. In the late 1800s, astronomers armed with cameras finally measured the size of the Solar System as Edmund Halley had suggested. This year’s transit is the second of an 8-year pair. 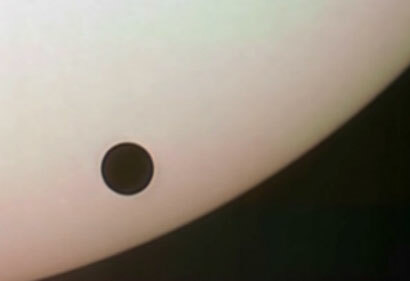 Anticipation was high in June 2004 as Venus approached the Sun. No one alive at the time had seen a Transit of Venus with their own eyes, and the hand-drawn sketches and grainy photos of previous centuries scarcely prepared them for what was about to happen. Modern solar telescopes captured unprecedented view of Venus’s atmosphere backlit by solar fire. They saw Venus transiting the sun’s ghostly corona, and gliding past magnetic filaments big enough to swallow the planet whole. 2012 should be even better as cameras and solar telescopes have improved. Moreover, NASA’s Solar Dynamics Observatory is going to be watching too. SDO will produce Hubble-quality images of this rare event.